Internet2 and the NSF have selected the project proposal by Drs. Lytton and Dura-Bernal, "Deciphering the Brain’s Neural Code Through Large-Scale Detailed Simulation of Motor Cortex Circuits", for the first phase of their Exploring Clouds for Acceleration of Science (E-CAS) project. The year-long project aims to help decipher the brain’s neural coding mechanisms, with far-reaching applications, such as the development treatments for brain disorders, the advancement of brain-machine interfaces for people with paralysis, and the invention of novel artificial intelligence algorithms. 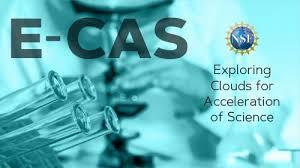 The E-CAS project has received support from Amazon Web Services and Google Cloud. The Neurosim Lab's research will involve an estimated 145K simulated neural activity totaling 9.28M core hours on the Google Cloud Platform (GCP), and generating approximately 2.9 TB of data. Additional information about E-CAS and phase one of the project can be found on the Internet2 website and news page.